Hello my fellow Pentester/s, In this tutorial i’m gonna show you how to do pentesting on network, selecting target and gaining access to them. The scenario here is, first we will do a reconnaissance or information gathering, then do vulnerability scanning and finally do exploit. We are going to use Eternalblue and DoublePulsar, This exploit is collaborate together, “EternalBlue” used as backdooring on windows and “Doublepulsar” used for injecting dll payload file. 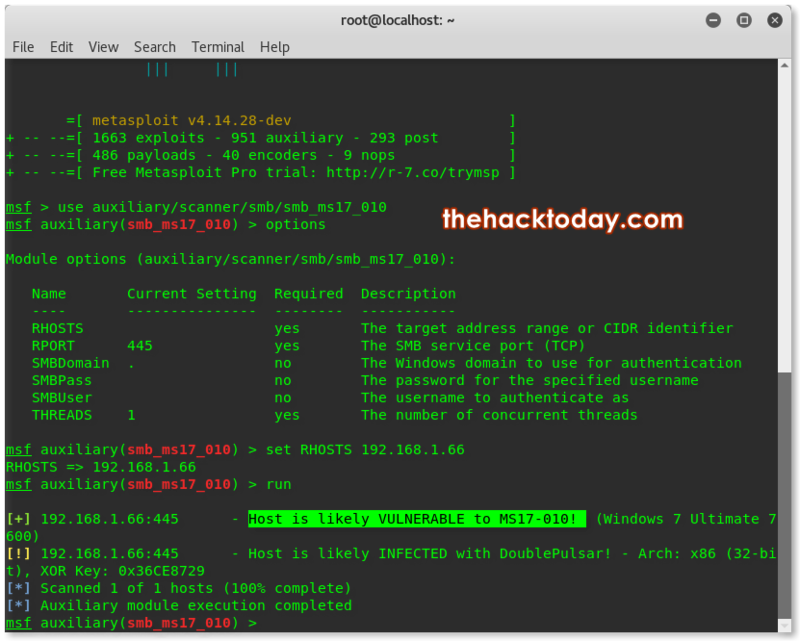 We will use Nmap and Metasploit as well. Lets jump into terminal ! Firstly, connect into wireless network, i used to connect into public wifi like cafe or public areas. Because it’s more fun of having random target right? I would not go into how could you get into that network, that would be so long tutorial btw. [inner backlink] I assume you have connected, now take a note to be identified later. Know your local IP ! From here, now you know who you’re, where you’re, know your machine ID, and network infos. Now start scanning and looking for target :). As usual we will using Nmap. By the way, i will resume to make it short, im interesting on EternalBlue and DoublePulsar exploit. Have your ever playing around with it? 😉 trust me its fun. And believe or not, that famous exploit still exists nowadays. Because what? Because the users is lol. Eternalblue and DoublePulsar is behind the wannacry ransomware, if you have windows machine then consider blocking all vulnerable ports of smbv1 services to prevent wannacry attack or EternalBlue and DoublePulsar Exploit. Abusing a vulnerability in Windows’ Server Message Block (SMB) on port 445, EternalBlue allowed the WannaCry ransomware to spread like a worm and hit over 200,000 machines within a few days only. Before WannaCry, however, a crypto-currency mining botnet dubbed Adylkuzz had been using the same exploit to compromise devices. As you can see, this target is vulnerable to ms17_010. Ok, next step, while firing up msfconsole, find that exploit located. Notice that there is two types of modules listed above, Auxiliary the scanner and Exploit. We will use the Auxiliary module and use different exploit module later. See this video to install EternalBlue DoublePulsar exploit modules. Now switch to msfconsole window. First we use the scanner module to make sure the exploit run at least succeed ;). The target machine is x86 / 32-bit. Now its time to exploit ! Exploit Succeed ! now we got meterpreter sessions with authoritive privilage. From here you can control this machine. run VNC, set RDP, set persistence backdoor to auto connect back to us. etc. We have pwned his/r windows machine. This kind of attack also showed at MR. ROBOT Hacking Technique Series.